If this blog post caught your eye, it’s safe to assume that you’re wary of humanorightswatch.org and other spam links showing up in your Google Analytics. These spam back-links damage your site’s SEO ranking. I personally noticed a significant rank drop on one site I manage since these links started happening. Why Do Spam Back-links Happen? Google assesses your site rank based on many factors, including the links that lead to your site. When a spammer hammers you with referrals from poor quality links, that can negatively impact your site’s assessment. What Happens When I Go To Humanorightswatch.org? When a user clicks the humanorightswatch.org link they may be temporarily redirected to http://shopping.ilovevitaly.ru/, and then on to http://aliexpress.com. I have noticed that the original link has changed a few times in the past couple of months. Odds are people are catching on, and the spammer is changing the domain frequently. Some articles on this topic advise users to hide these referrals from showing up in Analytics. This is only a partial solution, however because although the links don’t appear, they’ll continue to damage a site’s SEO rank. Luckily, there is a quick and easy solution, that I recommend you apply as soon as possible. 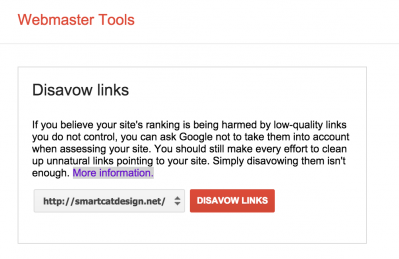 Google webmaster tools introduced a feature called Disavow links. With this tool, you can let Google know not to factor these low quality links when assessing your site. # these domains all seem related. All of these are spam referrals. 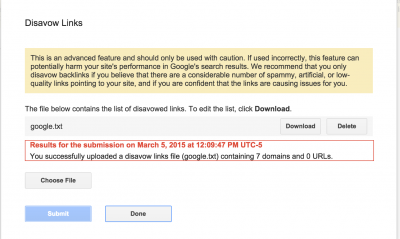 Step 3: Upload the text file you created from Google’s Disavow page. This should resolve the issue. If you notice new or different links coming in , repeat the same process for those. Thanks a lot, very useful. I have about 100 visits from humanoright(…) with 50% bounce rate. sounds very similar to my situation, I keep having to check site referrals because they appear to have more than 1 site doing the same thing, and I think it changes every so often. Hey very cool site!! Man .. Beautiful .. Amazing .. I will bookmark your site and take the feeds also…I’m happy to find so many useful information here in the post, we need work out more strategies in this regard, thanks for sharing. . . . . . This has been a pain for me for a long time~ Thank you, thank you for this tutorial!